Those of us in Chicago are familiar with the Million Dollar Quartet, a musical inspired by a jam session involving Elvis Presley, Johnny Cash, Jerry Lee Lewis and Carl Perkins back in 1956. A guitar signed by all four actual members, along with some other Presley memorabilia, will be up for auction next month in no other place than the King’s hometown of Graceland. The guitar is expected to sell for between $20,000 and $30,000. Other notable Presley items for sale include a jumpsuit he wore in Las Vegas in 1973, known as the “Starburst” jumpsuit, expected to fetch between $100,000 and $150,000; a 1956 signed transfer agreement that moved 15 songs under the umbrella of his publishing house (Gladys Music) expected to sell for between $20,000 and $30,000; and a Walther Model PPK/S 9mm Kurz handgun he owned, engraved with “Elvis” and “TCB,” expected to be sold for between $100,000 and $150,000. The auction will be at the Graceland Archives Studio August 13th at 8 pm EDT and online via eBay. 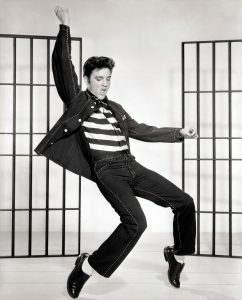 174 lots will be featured, comprising the third and largest auction of Elvis Presley artifacts. August 8th – 16th is considered Elvis Week.